On her last day, Dr. Han Thieu, a Vietnamese doctor in Montreal, reminisces about her life, her husband, daughters, adopted son Quan, and friend Mathieu Hibou. In an act of love, she has decided to spare them her descent into unbearable pain and eventual death. Each of her remaining moments is like the rustling of papaya leaves—a sound only audible to those who choose to listen. Each memory brings sorrow and joy. For in life, love is but the counterface of suffering. Then with her last gasp, the story begins. The dark pain of post-war Vietnam and Cambodia blends into the youthful resilience of Malaysia and Thailand, the discovery of Canada and then new tragedies in Africa and the Middle East. 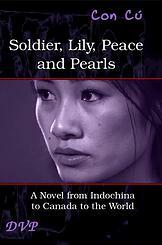 Soldier, Lily, Peace and Pearls is a story teller’s tale. With every page you turn, let the ink lament a land lost, the paper sigh for past love and the letters paint desire for life renewed.